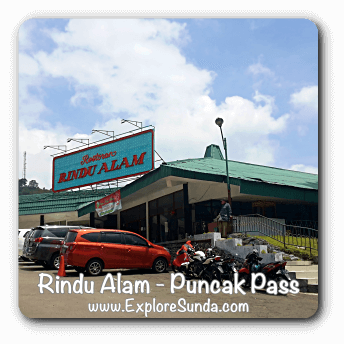 Puncak Pass: Where to Eat? Where to Eat in Puncak Pass? Since Puncak Pass is one of the most favorite vacation destinations in the land of Sunda, there are plenty of restaurants we can choose: from a global fast food chain to a family-owned restaurants, from Indonesian food such as Sundanese or Padang, to Chinese, European, or Far-East cuisines. 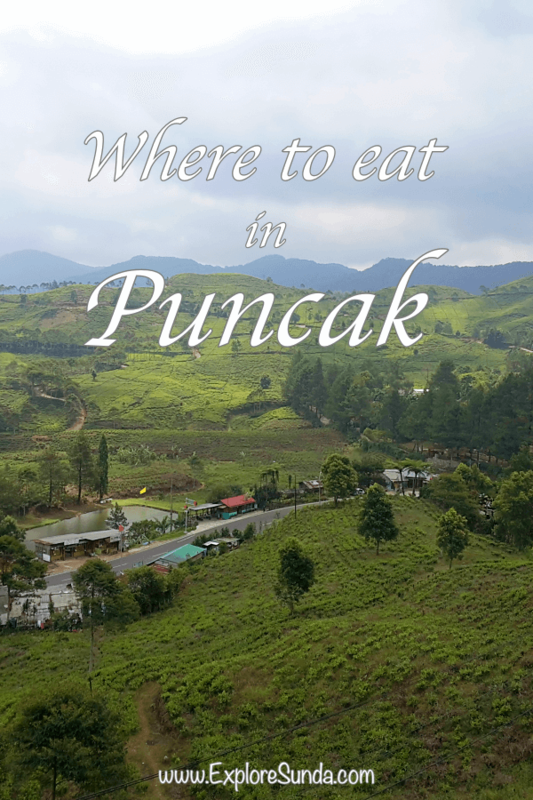 In my opinion, there are two types of places to eat in Puncak. First, inside the places of interest we visit. Most of them will not let their visitors bring outside food and drink, so, it is not a question whether the food are delicious, it is more of whether the place is attractive and enjoyable. The second type is the restaurants where we go because of its delicious food. If the restaurants have beautiful view, that would be a bonus ;-) Are there many restaurants like this in Puncak? This is one of the older restaurants in Puncak. It serves various Indonesian cuisines, but its special menu is satay. Rindu Alam has the best view of the tea plantation in Puncak. It is located on top of a slope, so the window seats on the terrace has the best view as long as you can stand the constant cold breeze. It seems many people can't stand the cold, so the restaurant put up fiber glass walls all over the terrace. Unfortunately now the fiber glass is not clear anymore, which blurs the view. The better view is actually at the edge of the parking lot. We get an unobstructed gorgeous view of the tea plantation here, as long as you don't look down, where too many trashes pile up there. Recently, there is a newer restaurant adjacent to Rindu Alam: Puncak Asri Restaurant. However, if you only want to hang out enjoying the view in this area and don't mind about the food, there are many shacks along the road serving coffee, grilled corns and instant noodle. All of them have small dining area where we can relax to enjoy our food and view. Bumi Aki (Sundanese words for grandpa house) serves typical Sundanese cuisines, including the traditional deserts such as bandros and kue cubit as well as bandrek. Surprisingly, they also serve instant noodles! There are several branches in Puncak as well as in Bogor and Cianjur. The name of the restaurants is either Bumi Aki or Bumi Nini (Sundanese words for grandma house). Started selling food in a food truck in Cipanas, Puncak, now Amen Group has several restaurants and a hotel, all located in one huge land in Cipanas. The three stories building is easy to spot with a big letters of Amen on the side of the building. The main restaurant, Amen, serves Hakka cuisines, a full range of delicious Chinese food. The second one is Amen Express, which specializes in serving breakfast menu, such as chicken noodle, congee, and dim sum. If you prefer Sundanese cuisines, try nasi liwet served by Bakoel Karasa. It has shared parking area with Amen, but it has its own building behind the main restaurant. This group of restaurants doesn't offer any beautiful view of Puncak Pass, so people come here solely for its delicious food. On weekends, the restaurants are always full during lunch and dinner. Puncak Pass resort is the pioneer of hotel and restaurant in Puncak. They opened since 1928 and until now they have not changed the recipes and the look. So, many people come to the restaurant to reminisce the old-time cuisines such as Poffertjes, Pannekoek (pancakes), and Bitterballen. The restaurant, especially its terrace, is a great place for hang out with family and friends. There are two Cimory restaurants in Puncak: Cimory Mountain View and Cimory Riverside. Since Cimory started as a cow farm, it is a producer of cow based products such as sausage, yoghurt and chocolate. Hence, each of the Cimory restaurants has shops selling its products. If you come from Jakarta, first you will pass Cimory Riverside on the right side of the road. Five hundred metres down the road you will see Cimory Mountain View on the left side of the road. Cimory Riverside has a nice view of river in the backyard, although sometimes the river smells bad. Recently, it opens a 3D art trick. 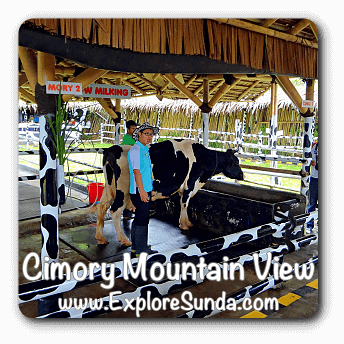 Cimory Mountain View has a program to educate children about cow, parts of beef and how to milk a cow. They have a couple of cows in a cowshed at the far end of the backyard, where we can learn how to milk a cow. No wonder many schools arrange a field trip there. Bavarian Haus is the newest addition of restaurant in Cimory group. You will hardly miss it, just look for an outstanding German looking house on the right side of the road if you come from Jakarta. Bavarian Haus is a premium restaurant that specializes in German cuisines. It opens from 10am to 10pm daily.